Blowers & Rod Ovens | R.J. Kates Co. The RAMFAN UB30 Turbo Ventilator is a 12-inch (30cm.) blower/exhauster. These blowers-exhausters use a high-performance turbofan design combined with high strength polymers to create rugged, portable turbo blowers. 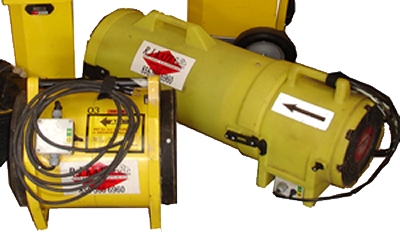 These blowers are designed for general use, confined space, hazardous ventilation, and consistently deliver high airflow. We carry blowers capable of 1200 CFM and 2500 CFM, the latter, a 12″ model, is detailed in the PDF below. For more feature details, you can review the specifications an example of our blowers from Euramco Safety, the manufacturer. 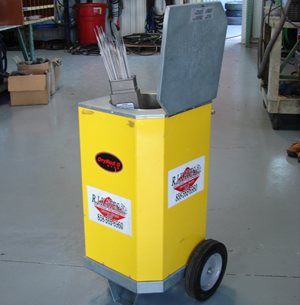 Phoenix DryRod® portable rod ovens offer welders increased portability. This DryRod® oven type 5 featured is available with wheels. With an electrode capacity of about 50 lbs. for 14 in or 18 in electrodes, this type of rod oven can be filled from a large capacity storage oven and supply multiple welders with electrodes throughout the workday. These rod ovens ensure electrodes remain moisture-free in the field and meet welding code requirements. This particular rod oven includes a thermostat to adjust oven temperature in line with electrode requirements. Features of the type 5 rod oven include body and lid insulation to minimize heat loss and energy usage; Safety Yellow color to increase field visibility; and a spring latch to tightly secure the insulated lid for transport. Built with heavy gauge steel and powder coated to withstand challenging conditions and 10 ft cord that locks into the oven base to create a fixed connection, these rod ovens are suitable for multiple projects.